I saw this and absolutely had to share it with everyone. Lily Vanilli is supporting young people with cancer and delighting scientists, geeks and deranged woodsmen everywhere by baking special bleeding heart shaped cupcakes this Valentines day. 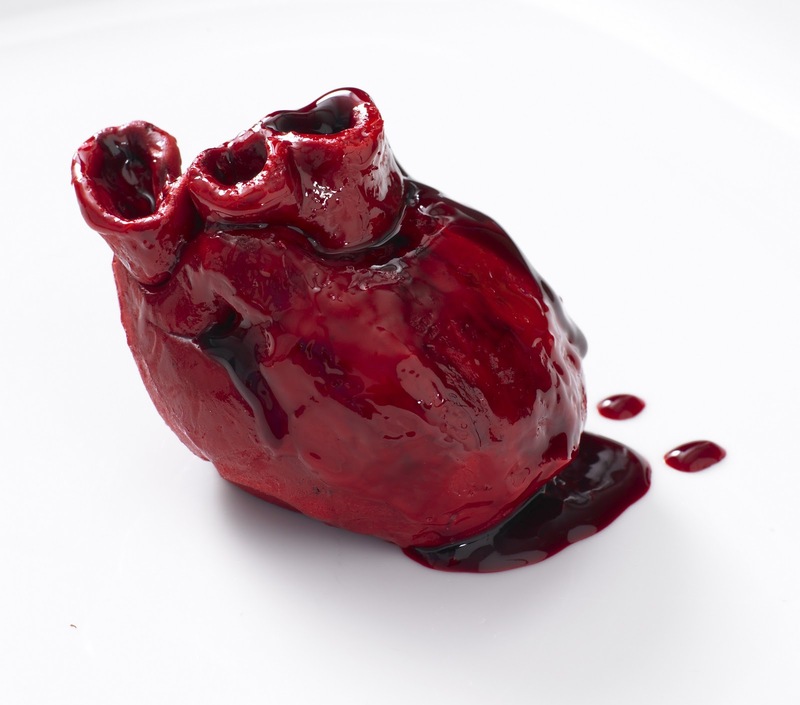 "Scarily realistic, each edible heart cake is baked with a delicious red velvet sponge, cream cheese frosting and blackcurrant cherry 'blood'. A single ʻbleeding heart cakeʼ is priced at £7 and comes in a cute perspex box tied with apink or red ribbon with a personal note." The cake is available exclusively through their website and 20% of the proceeds go directly to charity. For those of us in love with the idea of baking up bits of anatomy for loved ones, Lily Vanilli provides instructions on their blog. Doesn't sound too difficult, right? How about a gallbladder cupcake? Or a Kidney? Yum yum. 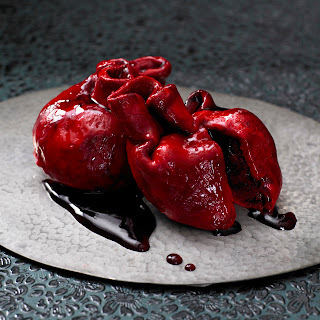 Whatever you do though, don't eat your bleeding heart cake like this guy (Warning: graphic cake consumption. I love the cake but I'm now a little scared of Tim Wheeler). Well you can, but I'm not certain you'll earn many points with your significant other on Valentines day--unless they're a zombie. As one who has passed out three times now trying to give blood, I read this post with my eyes half closed. That's really gross and cool at the same time. My sons would love it, but I'm not sure I could stomach it. Don't feel bad Curtis, I have the distinction of passing out three times in biology classes. I can look at this on the website but I'm not sure I could be present while someone ate this cupcake. Which is exactly why Mr. Humble will not be getting one of these for V-day. He would gleefully torture me with it. i could not bake these but, giving a percentage for charity for kids is just the best! Thanks for sharing! That's cool but I don't think I can put that in my mouth. I still like it though! Brilliant! That is really gross...I think I just felt my stomach turn. Off topic, does anybody here have a suggestion for an easy carrot cake recipe for somebody isn't so great in the kitchen? My BF's birthday is next week and carrot cake is his favorite! It's certainly very realistic and well done but the fact that it looks so real makes it a problem to eat. I would feel like Hannibal Lector. I have an aversion to Red Velvet Cake on account of the colour but this has taken my 'red cake' aversion to a whole new level. I have to say that this has to be the most unpalatable thing I've ever seen on your blog, Ms. Humble, but thanks for sharing anyway. That is creepy, but wicked cool! Amazing work but looks a bit scary. ~_~ Great for Halloween party! I visit your blog often, even if I don't leave a comment, however I think this is the firs time I've been grossed out. Thanks but no thanks. Geoff. Are you for real? I could never eat this. My mind messes with me too much, I started gagging just thinking about it. Great idea for the Science Lovers though. I think this one is pretty gross, maybe belongs on above website. Makes you stop to read about it too ! Crazy what people can do with food! My Picks For Re-Inventing the Lamington 2011!